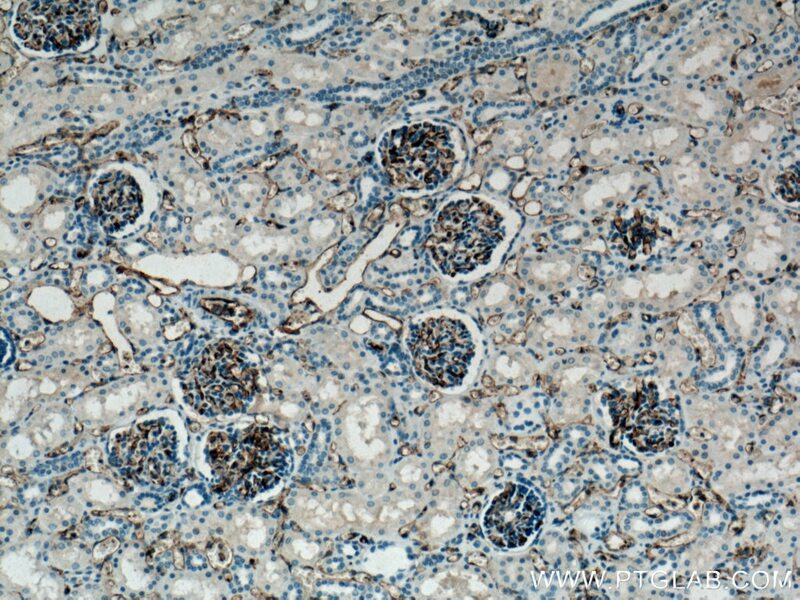 Immunohistochemical analysis of paraffin-embedded human hepatocirrhosis tissue slide using 11265-1-AP (CD31 antibody) at dilution of 1:800 (under 10x lens). 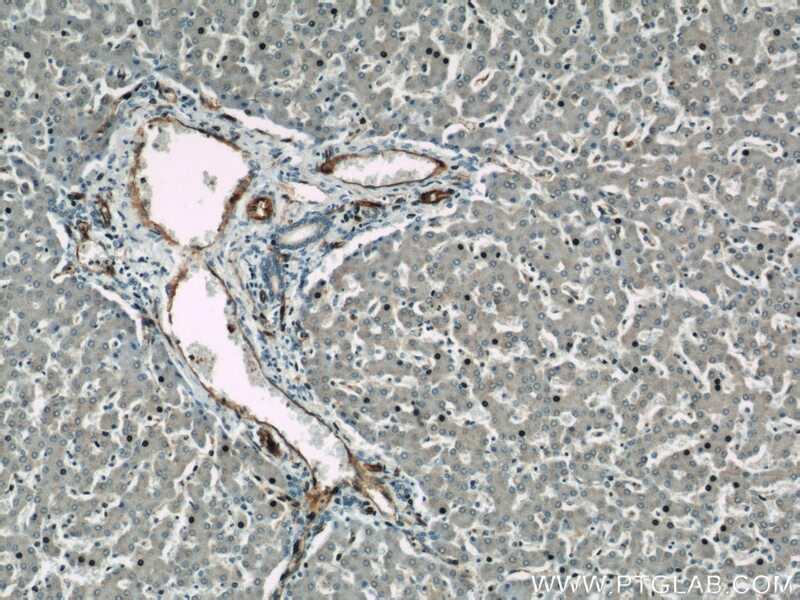 Immunohistochemical analysis of paraffin-embedded human hepatocirrhosis tissue slide using 11265-1-AP (CD31 antibody) at dilution of 1:800 (under 40x lens). 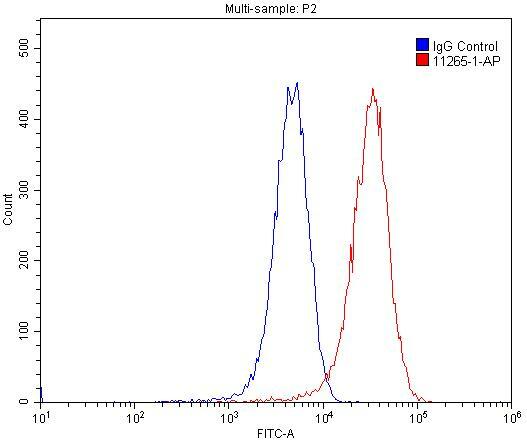 IP Result of anti-PECAM1,CD31 (IP:11265-1-AP, 5ug; Detection:11265-1-AP 1:300) with Jurkat cells lysate 4000ug. 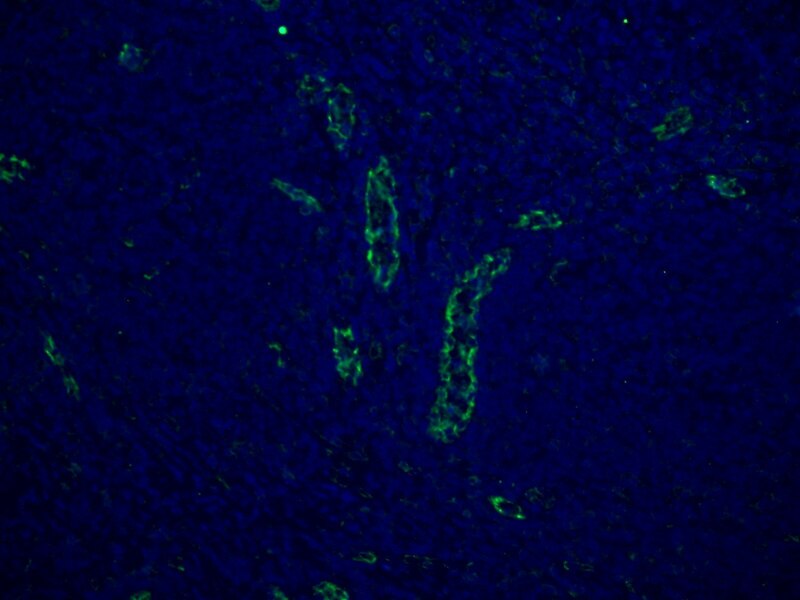 1X10^6 HUVEC cells were stained with 0.2ug CD31 antibody (11265-1-AP, red) and control antibody (blue). Fixed with 4% PFA blocked with 3% BSA (30 min). Alexa Fluor 488-conjugated AffiniPure Goat Anti-Rabbit IgG(H+L) with dilution 1:1500. 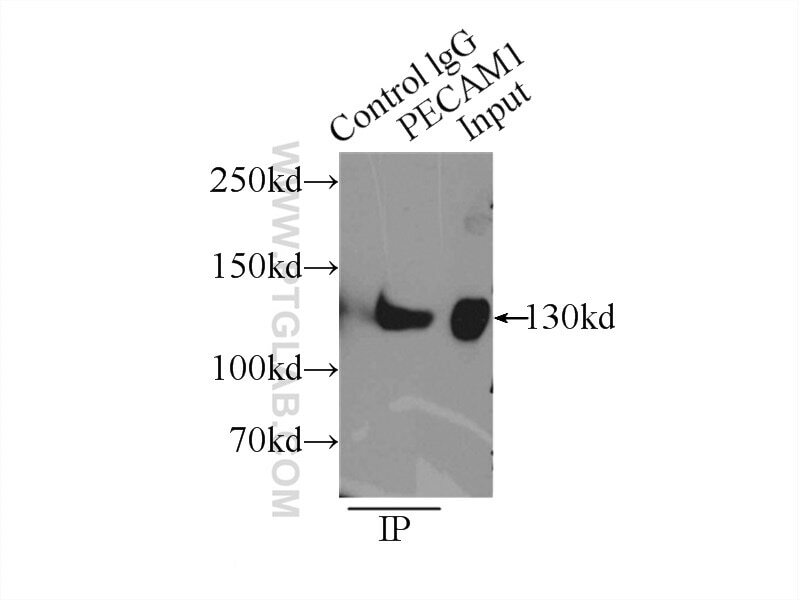 Platelet endothelial cell adhesion molecule-1 (PECAM-1, CD31) is a member of the immunoglobulin gene superfamily of cell adhesion molecules. 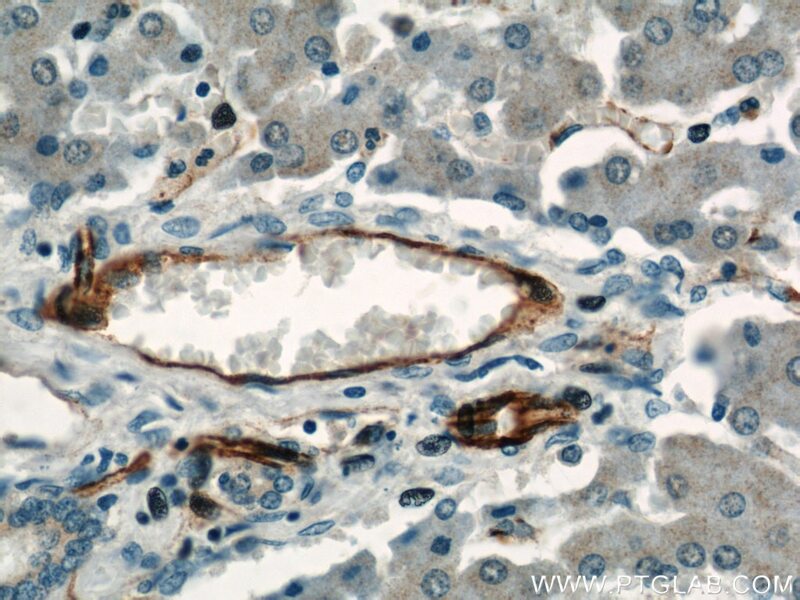 CD31 is a transmembrane glycoprotein with a molecular mass of approximately 120-140 kDa. It is highly expressed on the surface of the endothelium, making up a large portion of its intracellular junctions. 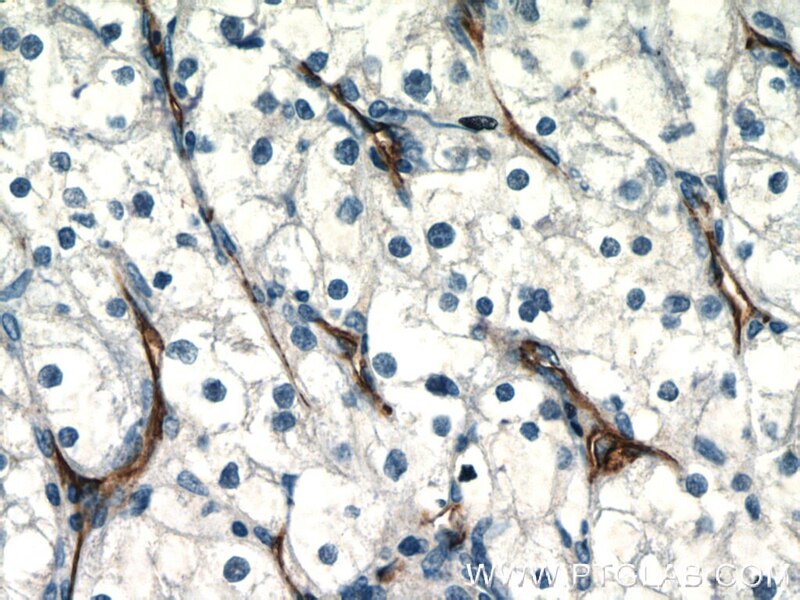 PECAM-1 is also present on the surface of hematopoietic cells and immune cells including platelets, monocytes, neutrophils, natural killer cells, megakaryocytes and some types of T-cell (PMID: 9011572). As well as its role in cell-cell adhesion, PECAM-1 functions as a signaling receptor, and is involved in important physiological events such as nitric oxide production, regulation of T-cell immunity and tolerance, leukocyte transendothelial migration and inflammation and angiogenesis (PMID: 21183735; 20978210; 17872453; 20634489). ATAD2 silencing decreases VEGFA secretion through targeting has-miR-520a to inhibit angiogenesis in colorectal cancer. Hypothermic oxygenated perfusion (HOPE) attenuates ischemia/reperfusion injury in the liver through inhibition of the TXNIP/NLRP3 inflammasome pathway in a rat model of donation after cardiac death. Triptolide inhibits vascular endothelial growth factor-mediated angiogenesis in human breast cancer cells. 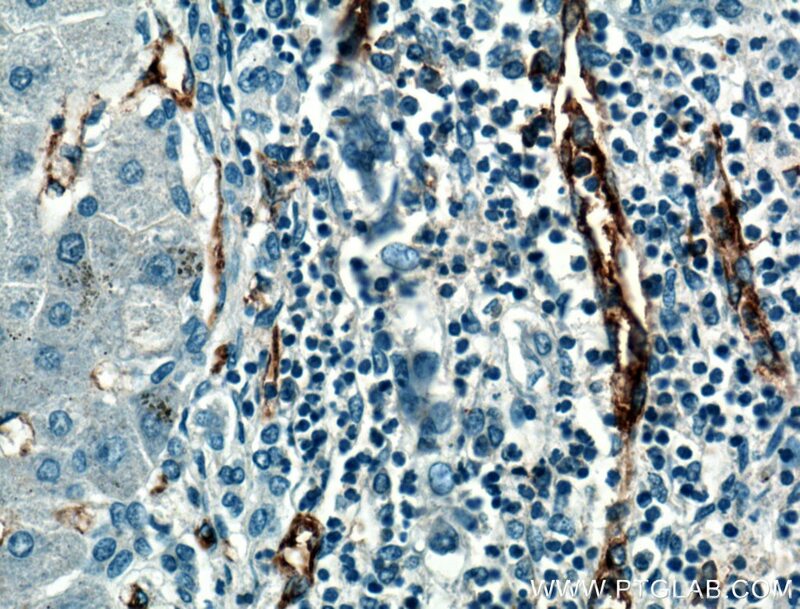 Andrographolide inhibits breast cancer through suppressing COX-2 expression and angiogenesis via inactivation of p300 signaling and VEGF pathway. 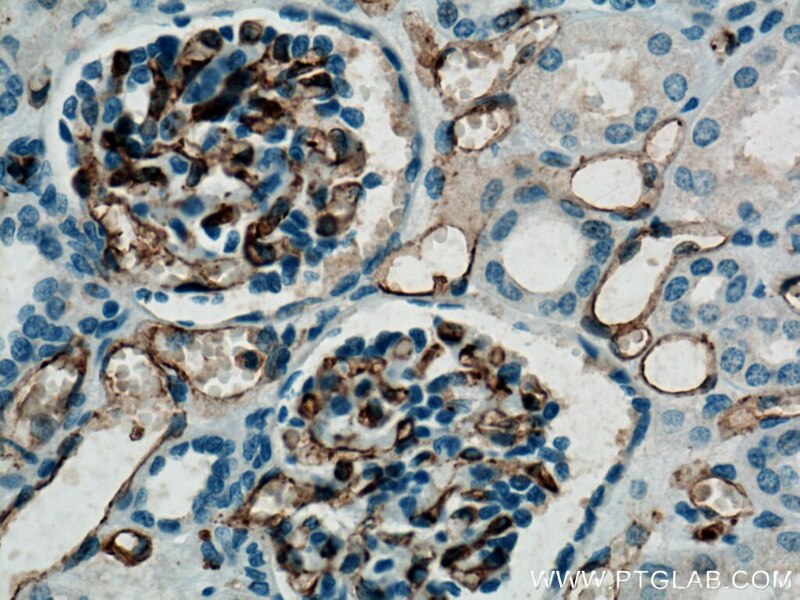 MKP2 inhibits TGF-β1-induced epithelial-to-mesenchymal transition in renal tubular epithelial cells through a JNK-dependent pathway. CD90 determined two subpopulations of glioma-associated mesenchymal stem cells with different roles in tumour progression. 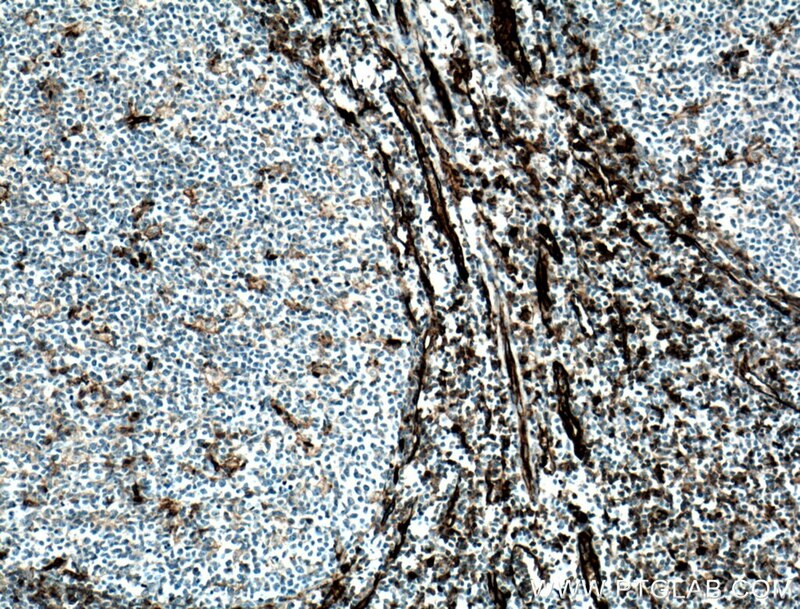 Immunohistochemical analysis of paraffin-embedded human kidney tissue slide using 11265-1-AP (CD31 antibody) at dilution of 1:4000 (under 10x lens) heat mediated antigen retrieved with Tris-EDTA buffer(pH9). 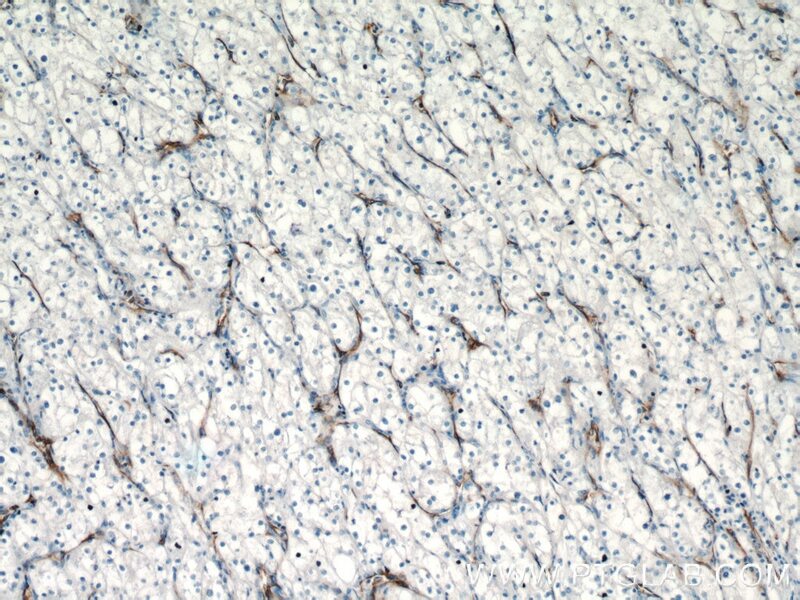 Immunohistochemical analysis of paraffin-embedded human kidney tissue slide using 11265-1-AP (CD31 antibody) at dilution of 1:4000 (under 40x lens) heat mediated antigen retrieved with Tris-EDTA buffer(pH9). 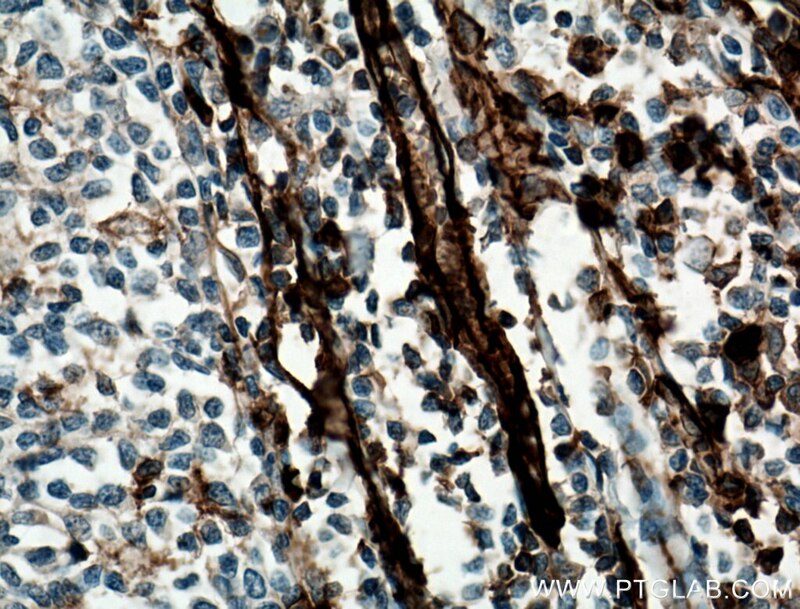 Immunohistochemical analysis of paraffin-embedded human tonsillitis tissue slide using 11265-1-AP( CD31 antibody) at dilution of 1:800 (under 10x lens) heat mediated antigen retrieved with Tris-EDTA buffer(pH9). 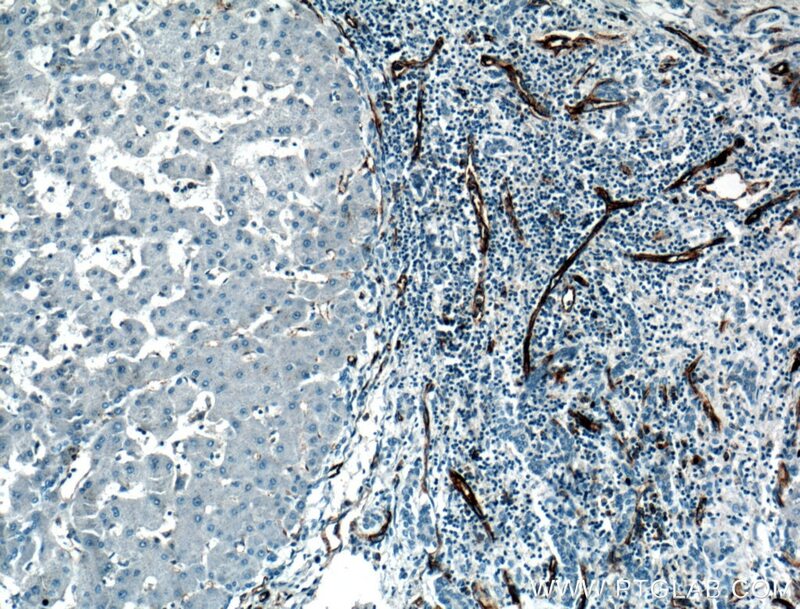 Immunohistochemical analysis of paraffin-embedded human tonsillitis tissue slide using 11265-1-AP( CD31 antibody) at dilution of 1:800 (under 40x lens) heat mediated antigen retrieved with Tris-EDTA buffer(pH9).